Creating an enviable deck or patio doesn’t have to break the bank. Sure, dropping tens of thousands on your outdoor space will yield some incredible results, but with a little elbow grease and some thrift, you can create a unique escape that will take your neighbors breath away. 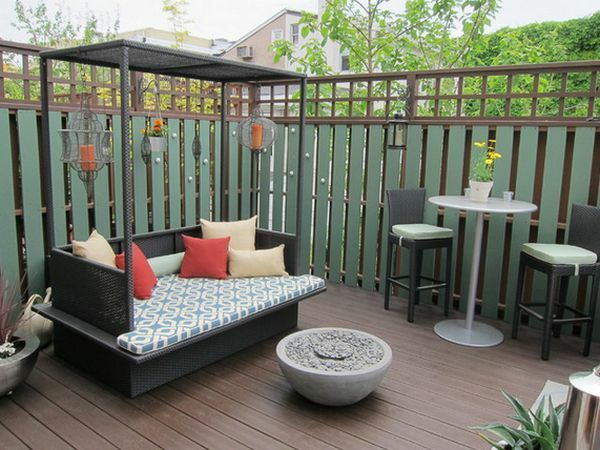 Here are 12 deck and patios ideas you can use to affordably realize your backyard dream. Pallets are a quick and easy way to create an artistic deck. You can find pallets inexpensively through Craigslist or by hunting around delivery docks at stores, and they are one of the most versatile DIY materials there are. Paint or finish them any color you’d like, arrange them in any shape, and even build tables, planters and chairs out of them. This deck construction style saves you a lot of money on lumber frames. You can make these decks even more alluring by leaving out panels and by filling them with plant life or even using curved wood. Take a good look at your deck—if it’s structurally sound, all it may need is a facelift. Simply refinish the material or add a painted design with stencils. Increase the visual appeal with beautiful potted plants, new tables or chairs or even reupholster or paint your old ones. Throw pillows and canopies are another great way to breathe new life into an worn deck. Patios and decks don’t have to be traditional. Space out an area and fill it with gravel for a practically maintenance-free retreat. You can mix in colored glass for a pop of color, and have fun with the furniture. Adding a canopy will make the space even more unique. Patios don’t have to be solid. Use CMU pavers to create a chessboard pattern. Use it like a traditional game board with oversized pieces, or just enjoy the fun pattern as you lounge. Eclectic is in and avant garde is trendy, and both can be good for your budget. Explore online classifieds or home improvement store salvage bins for materials you can use to make a chic floor. You can find amazing materials like slate and granite as well as traditional brick, concrete and paving stones. Mix and match or go with one material for a mosaic style look. Break free and create a patio that moves you. Use paving stones, concrete pavers and even poured concrete to create movement in your backyard, both free form or geometric. Think of concrete pavers and paving stones like an area rug. Create a design or stain them in colors to make patterns. We promise it’s easier than it sounds, and to save even more, you can salvage old bricks or use other neighbor’s leftovers. The mixed brick creates a whimsical cottage feel and you can easily design it to any shape you want. Think away from the ground and look to the sky. You can skip the patio and simply enjoy a shaded area. All you need is PVC pipe or wood, and curtains to drape for a fast cabana. You can get further creative with curved iron and sails. Remember those paving stones? If you create space between them you can plant a ground cover like buffalo grass for a luscious lawn/patio combo your feet will love. Inspired to give your patio or deck a facelift and don’t want to do it yourself? Use our instant estimate tool to get a price in seconds and find certified professional in your area. Get a price. Get a pro. Get it done.